Photo: Katie Yu/The CW -- © 2016 The CW Network, LLC. All rights reserved. Barry (Grant Gustin) is mentoring Jesse (Violet Beane) now that her speedster powers have manifested (not poor Wally though) and has to take on some familiar rogues from the comics now with a twist. Enter Mirror Master (Grey Damon) and his partner in crime, Top (Ashley Rickards). Top has traditionally been a man named Roscoe Dillon but as executive producer Todd Helbing explains in the featurette, they decided to gender swap and created Rose Dillon. As the names imply, Mirror Master can manipulate the use of mirrors and Top spins fast enough to deflect bullets. Both are looking to even the score with Captain Cold (Wentworth Miller) who we see in a flashback, before the particle accelerator explosion. 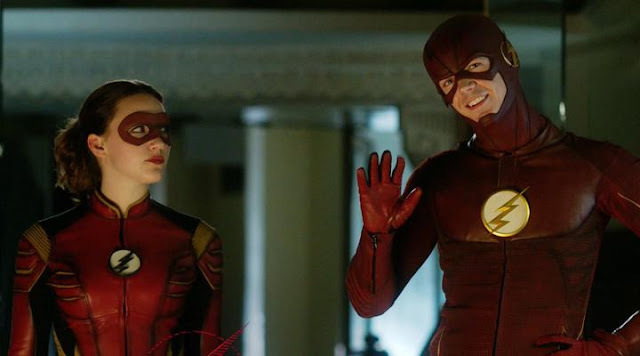 The Flash 3x04 "The New Rogues" Inside - Barry (Grant Gustin) continues to train Jesse (guest star Violett Beane) and when a new meta human, Mirror Master (guest star Grey Damon), appears on the scene he lets her tag along. Mirror Master has teamed up with his old partner, Top (guest star Ashley Rickards), and is looking for Snart (Wentworth Miller) to even a score. Jesse is quick to join the chase but defies one of Barry’s orders which results in disastrous consequences. The Flash airs Tuesdays at 8:00pm/7c on The CW.